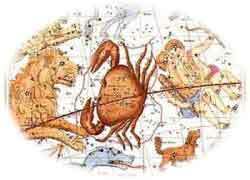 The Cancer Constellation in the Zodiac! In Greek myth, the second labor of Hercules was to slay the many-headed monster Hydra. Hera (Juno) sent a crab to bite the heel of Hercules while he struggled with Hydra. Hercules crushed the crab underfoot; this explains why the crab is the hardest constellation to see, with no bright stars. If not for the fact that it lies on the Ecliptic, and is therefore part of the zodiac, Cancer would be a rather inconspicuous group of stars. It is home to the relatively nearby Beehive/Praesepe complex of star clusters. Emotional sometimes, Cancer sun sign people tend to be some of the more caring people in our world. They are very loving and value family and friends over fame or fortune. You will always find this loving person with a dear pet of some sort. Extremely intuitive and imaginative, these people make great artists and designers. You will find them where ever there is a need for creativity and flare. Never underestimate the scope of their imagination either. Not a risk taker, the astrological sign of cancer is not likely to be betting the farm on a not so well thought out venture. Rest assured this wise person will be checking all the angles before plunging in to anything. Cancer people are very protective and sympathetic to those around them. They are very capable of "feeling your pain" whether it be physical, financial or emotional. They will help out to, as long as it is clear they are not being taken advantage of. 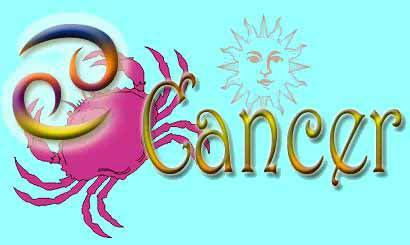 The Cancerian character is the least clear-cut of all those associated with the signs of the zodiac. It can range from the timid, dull, shy and withdrawn to the most brilliant, and famous Cancerians are to be found through the whole range of human activity. It is a fundamentally conservative and home-loving nature, appreciating the nest like quality of a secure base to which the male can retire when he needs a respite from the stresses of life, and in which the Cancerian woman can exercise her strong maternal instincts. The latter tends to like and to have a large family. `Nest like' is an appropriate adjective for the Cancerian home, for its inhabitants tend to favor the dark, mysterious but comfortable type of house which has something of the air of a den about it, a place which belongs to the family rather than existing as a showcase to impress visitors. That is not to say that the Cancerian is unsociable, just that for them there is a time to socialize and a time to be solitary, and this is part of the apparent contradiction in their nature. Outwardly they can appear formidable - thick-skinned, unemotional, uncompromising, obstinately tenacious, purposeful, energetic, shrewd, intuitive and wise, sometimes with a philosophical profundity of thought verging on inspiration. Their intimates, however, may see a very different character, one with a sympathetic and kindly sensitivity to other people, especially those they love. They are able to identify with the situations of others because of the keenness of their imaginations. They are often over-imaginative and prone to fantasy, sometimes trying to shape their lives to fit some romantic ideal. They are appreciative of art and literature, and especially of drama, where the spectacle and ebb and flow of action and feeling particularly excite them. They may themselves possess considerable literary, artistic or oratorical talent. Their sharp ears and talent for mimicry can sometimes give them success on the stage, though their tendency to be emotional may make them overact. Interestingly - because they give the impression of being down-to-earth - they are often fascinated by the occult and are more open to psychic influence than the average. If they can reconcile the personal conflict of their urge to be outgoing with the reserve that causes them to withdraw into themselves, then at best they can inspire a generation, especially the youthful part of it, by their idealism. A job in which they can express this, and in which they can do well, would be as a leader in a youth organization. In their personal relationships they are mentally a mixture of toughness and softness, often emotional and romantic to the point of sentimentality in their fantasies; but in real life and in marriage, their loving is not so sentimental but tenaciously loyal. Even if they have affairs (and they may do so, for the male in particular is open to sensual stimulation), their first loyalty remains to spouse and family, of whom they regard themselves as the protector. Both the Cancerian man and woman love unreservedly, giving much and asking little in return - in fact, one of the most important lessons they have to learn is how to receive gracefully. They are too easily influenced by those they love and admire, and swayed by the emotion of the moment. They are also loyal friends, the negative side of their faithfulness being clannishness, the narrow patriotism of "my country right or wrong"; and closing ranks in suspicion and coldness toward outsiders. Cancerians have a retentive memory, particularly for emotionally laden events which they can recall in detail for years afterwards. they are strongly governed by childhood memories and since they live intensely in the past in memory and in the future in imagination, a chance meeting with someone for whom they had an unrequited love, even if they thought they had conquered the feeling, will easily rouse the emotion all over again. The Cancerian has many potential faults. They can be untidy, sulky, devious, moody, inclined to self-pity because of an inferiority complex, brood on insults (very often imagined), yet are easily flattered. They can be tactless and difficult yet, because they are normally ambitious, they will curry favor by floating with majority opinions, outlooks and fashions of the day. As a result they often change their opinions and loyalties and, indeed, their occupations, and lack stability. They are easily corrupted and, because they are convincing romanticizers, can make successful confidence tricksters. Their romanticism in another sense make them ardent supporters of causes, for example a football team with whose heroes they can identify in a world of fantasy. Their abilities fit the Cancerian for a wide range of occupations. As they are interested in what people are thinking and able to judge what they can safely be told, they can be good journalists, writers or politicians, though in this last capacity they are more likely to remain in the background rather than attain prominent positions of power. They may, indeed, change their party affiliations. They can serve in other departments of public affairs, especially those which involve looking after others, for example in any kind of service from welfare and nursing to catering - their own love of comfort and good living makes the Cancerian an excellent chef or housekeeper. They sometimes have a penchant for trade or business and are often successful as a captain of industry. This is because they are excellent organizers with a good sense of value and economy which they may combine with a flair for inventiveness and originality. The romantic side of their natures make them enjoy grubbing about in places where exciting discoveries may be made (old stamp collections in attics, etc. ), and if they can do this professionally as a secondhand dealer or specialist in antiques, they will be happy. More common occupations which suit some subjects of Cancer are real estate broker, gardener and sailor. Physically they are average to below average in height, with a fleshy body and short legs in comparison with the rest of them. Their hair is usually brown, their faces round, their complexions pale, their foreheads prominent, their eyes small and blue or grey in colour, their noses short, perhaps upturned, and their mouths full. They sometimes walk clumsily. The planet / starstone is the beautiful, translucent, PEARL. The Pearl can be all the silvery colours of the moon and not just white. The pearl takes on its silvery, shimmering, colors from the color of the linings of the mollusc (oyster) in which it is grown. A beautiful, perfect pearl can sell for as much as $250,000.00, so speaking of a 'pearl of great price' becomes readily understandable. This precious stone can be harmed if subjected to hair spray, acids, perspiration, and some types of cosmetics. The Ruby is the birthstone of July under the sign of Cancer, it said to accord wearers wisdom, happiness and health, and to bring particularly good luck to gamblers and lovers. Rubies - especially fine rubies - are rarer than diamonds, emeralds or sapphires. On the famous Mohs hardness scale of 1 to 10, everyone knows that a diamond, as the hardest natural substance on earth, rates a 10. Rubies, at Mohs 9, are harder than any other material except diamonds. Fine rubies are the most expensive of all gems (with the one exception - very rare coloured diamonds, such as red). Some Famous Folks That Share My Birthday! Hardly a match made in heaven Aries and Cancer tend to clash. Do not despair if you are in one of these relationships, true love will overcome. Both Aries and cancer are powerful and very self expressive. However, Cancer can be sensitive and somewhat anxious while Aries people are dominant and spontaneous. Aries is not the greatest at expressing their feelings. This leads to the constant annoyance of the moody, retrospective Cancer.